﻿The aim of this book is to make The Dialogues of the Courtesans by Lucian of Samosata (c. 120 – 190 CE) accessible to intermediate students of Ancient Greek. The running vocabulary and grammatical commentary are meant to provide everything necessary to read each page, so that readers can progress through the text, improving their knowledge of Greek while enjoying one of the most entertaining authors of antiquity. 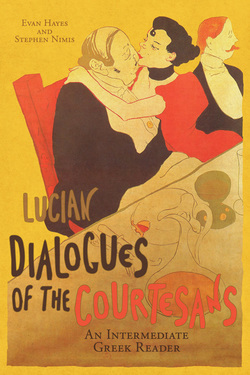 These dialogues are another example of Lucian presenting unusual perspectives on Greek culture and literature, this time by creating amusing dialogues that occur mostly among the professional companions, hetairai, who formed a special form of upscale entertainment for elite men in the classical period. The women in these dialogues sometimes interact with male clients, but in most of them we find only women, as they speak of their hopes and fears and the business of love. The Dialogues of the Courtesans is a great text for intermediate readers. Like many of Lucian's works, they are breezy and fun to read with relatively simple sentence structure. Some were considered too naughty for Victorian readers and were expurgated, particularly the oblique discussion of a night of gay carousing (5). A common theme is the problem of reconciling spontaneous affection and payment for services rendered. The courtesan “performed” love and affection, just as Lucian performs a version of Greek culture that privileges authentic Greek language and literature. Whatever else these dialogues are about—and there is plenty—they are also emblems of that peculiar moment in Greek literary history we call the Second Sophistic.